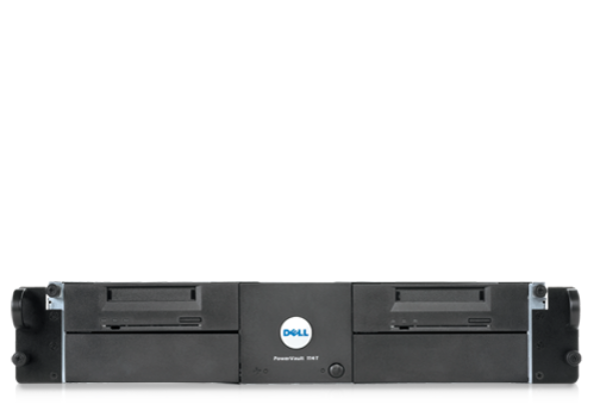 The Dell™ PowerVault™ 114x rackable subsystem is a convenient 2U tape rack enclosure. It incorporates many tape technologies commonly used today and is designed to complement Dell PowerEdge™ rack servers and Dell PowerVault network attached storage (NAS). The Dell PowerVault 114x tape rack enclosure offers superior capacity in a 2U form factor. The PowerVault 114x can be configured with one or two LTO-5-140, LTO-4-120, LTO-3 tape drives. The PowerVault 114x tape rack enclosure is a 2U tape array that incorporate a broad spectrum of tape technologies. It can hold up to 1.6TB of compressed data (when using two LTO-3 tape drives) in a 2U space. The maximum transfer rate of a single LTO-3 drive is 80MB/s. This translates into a combined native sustained backup rate of 576GB/hr with two drives. Two SCSI ports enable both drives to run in parallel, reducing the backup time for multiple server environments. Mission Critical - Perfect for server and storage environments where avoiding unplanned downtime and reducing recovery time through priority response are a must. The package includes priority 4-hour onsite service or optional 2-hour response with 6-hour hardware repair, Dell’s proven Critical Situation process, and emergency dispatch. Proactive Maintenance - Maximises the availability and stability of your infrastructure proactively. The package includes a detailed system assessment and implementation of driver or firmware updates and upgrades for your server or storage systems. Remote Advisory Options - Provides telephone and Internet access to technical expertise for specialised applications and solutions such as Microsoft Exchange, Virtualisation and more. Enhanced installation and configuration with Dell professional project management and documentation. A project manager will be acting as the single-point-of-contact for the entire installation project from pre-site audit to co-ordination of the installation and delivery of post-project documentation.